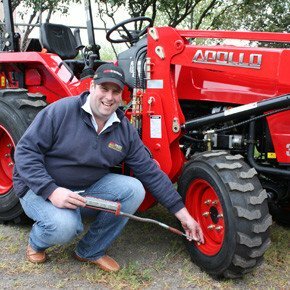 SOTA Tractor’s agronomist and small farms guru, Mark Crakanthorp, explains the importance of knowing your tyre configurations, to suit your farming needs. Traction is integral to safe and efficient tractor operation as the name tractor suggests. As a ready rule of thumb, the bigger and heavier the machine, the more stable it will be. However in the hobby farm market, outright size and power output are often less desirable due to size of the farms, the intended application and very often the topography – the relief or slope of the land. A configuration to improve stability of these smaller machines is often a suitable trade-off. When trying to tailor a tractor to suit a customer’s needs, the ultimate decision very often boils down to a trade-off. In other words, some functionality of the machine is reduced to the advantage of another function. A classic example that I see all the time is the need for a front end loader that can lift 500kg, but at the same time slash the front of a block without ripping up the lawn. Which trade-off or compromise the customer makes is based on the weight he/she puts on the relative importance of these requirements. With tractors, there are several configurations with regard to tyres, track and stability but with hobby farms, where sloping, less commercially productive blocks have often been subdivided from larger farms, stability is the big one! 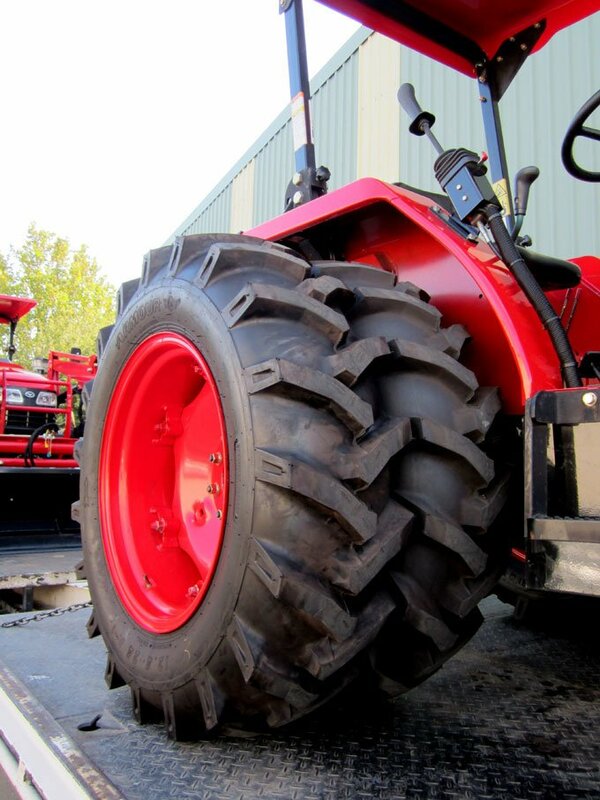 Often called flotation tyres, these types of tyres typically run lower pressure and spread the weight of the tractor. Although running higher pressures in the front is necessary when used in conjunction with a front end loader. You often see turf type tyres on machines working on turf farms and golf courses for their softer impact on those manicured areas. The trade-off? They wouldn’t pull the skin off a rice pudding! For real mountain goat country, we have fitted rear, dual-wheel (duals) setups, using the standard R1 Ag tyres. This makes for a seriously stable machine. Duals probably originate from the power farming machines of the early sixties, where development of 100+HP tractors began exceeding what could be delivered to the ground, at the drawbar. Culminating in the eighties, before zero till caught on, some seriously big tractors with massive tyre configurations operated on these shores. Almost without exception, at the 35HP/45HP end of the market, duals are particularly useful for taking on steep areas. So, for the soft, muddy hillside example, the duals would minimise slippage because of the more aggressive tread, while still having the benefits of a wide stance. Duals set on a narrow tyre bias. When we set up duals at SOTA, we like to have the inside tyre on its narrowest bias. Why? It is to do with the levering action that is exerted on the axle bearing for every inch you increase the track. The narrow inside bias counteracts this to some degree because it distributes some of the weight behind aforementioned bearing. We have seen some folk reverse, or bias outwards the front rims for a wider track. You’d probably get away with it if there wasn’t a loader, but the stresses of a loader on the smaller front axle bearing makes it a no-no for most applications. It is a serious trade off to consider as loaders are such a handy feature. Dual wheels widen the centre of gravity, increasing stability. The popularity of front end loaders (FELs) also adds an extra dimension to safely operating tractors on gradients. 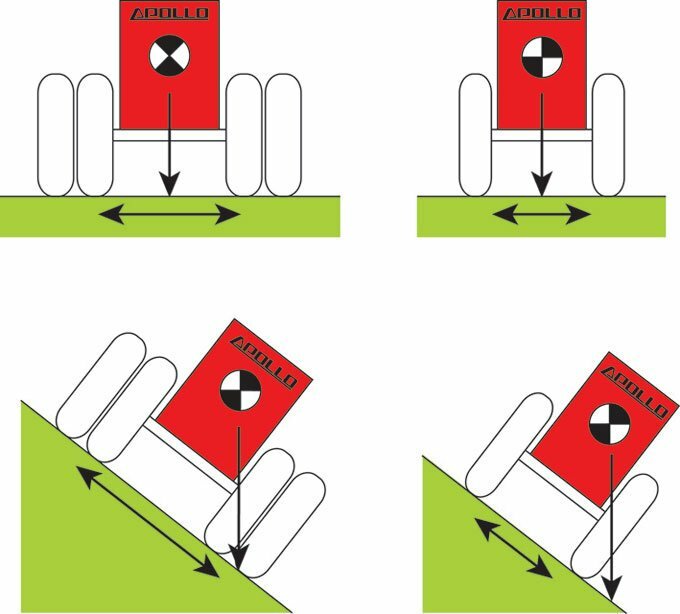 As they are raised above the front axle, the centre of gravity of the tractor also rises, exacerbating the likelihood of rollover. FELs can also block vision, increasing the risk of encountering depressions, pot holes and stumps. Water ballast is very useful for increasing stability. The trade-off here is that it is less than ideal for road travel speeds and can cause more soil disturbance. Water ballasting would also need regular checking to make sure weight is roughly even between the tyres. Uneven weight distribution can exacerbate the propensity for slippage or rollover. It would also unsettle FEL operation. Ballast will further bias weight to the rear of the machine. Hence, always go downhill forwards. The same principle applies to traversing up hills. If in doubt, reverse the tractor up the hill. If control of the tractor is lost, the danger of rolling or flipping the tractor is minimised (flips can occur if you roll backwards and suddenly brake or let out the clutch). The added traction and added front end weight of FWA tractors certainly improves safety. To have full control of the machine, you need to be familiar with its operation and mechanical soundness. Always make sure the skid brakes are locked together. Uneven brake pressure can literally force a tractor to slip or roll over. It is also important to use low gear, allowing the engine to brake the tractor when going down steep hills. It is counter intuitive, but tractors need to be driven down hills. Reducing power (or worse, freewheeling) to the transmission and relying on brakes have some very real risks. Likewise, going uphill – plan ahead! Again, you are in low gear. Gear changes, once the climb is started should not be necessary and are dangerous. If the clutch is engaged during ascent (or descent for that matter), you only have miss a gear to freewheel a couple of feet and the tractor’s speed will be more than the gear’s theoretical limit. This will cause the wheels to lock up and the tractor to slip/slide/lose control when the clutch is released. Engage 4wd and lock the diff to maximise traction. I don’t like the idea of prescribing a safe gradient for operating a tractor. Once an operator believes he or she is safe, operating a tractor on steep country, there is potential for danger. Being in control of the tractor is the number one priority. Avoid crossing steep slopes. If you are traversing across a hill and you begin to slip or even feel unsafe, always turn downhill. If you are interested on exploring the benefits of a tractor and dual-wheel option, please contact SOTA Tractors. Published as an editorial in Farm & Farm Machinery. Myles Larden – Axemen Logging and Exports – Mullumbimby, NSW.